The road to legal sports betting in Washington has progressed fairly quickly over the last few months. Last December, the D.C. Council passed the Sports Wagering Lottery Amendment Act of 2018, which Mayor Muriel Bowser signed in January. The next month, the D.C. Council gave final approval to the bill fast-tracking sports betting. And just last week, Monumental Sports owner Ted Leonsis announced that there will be a sportsbook inside Capital One Arena. Based on this timeline, one might think that legalized sports betting in D.C. is imminent and wagers could be placed on the NHL playoffs when they begin next week. But that’s not the case. What about wagering on your phone with an app? Not until next year. Brick and mortar venues in the District — including Capital One Arena, Audi Field, Entertainment and Sports Arena and Nationals Park (and the two block radius surrounding each venue) — will get first crack when it comes to offering sports betting. However, regulations still need to go up for public comment in June with the expectation of adoption in July. The goal would then be to launch sports betting in time for the start of the NFL Season (the Chicago Bears and Green Bay Packers open the season on Sept. 5). As far as the two block exclusion around the buildings, public affairs officer for the Office of the CFO David Umansky told WTOP that you will only be able to use a separate app with a URL associated with those venues. He also confirmed that late summer/early fall is the likely time frame for allowing the venue’s sports books to accept bets. The District’s smartphone app, which will allow you to be able to place bets anywhere inside the District, faces a longer timeline. The bill passed by the D.C. Council in February granted Intralot, D.C.’s lottery vendor, the contract to become the only operator outside of the city’s sporting arenas for the foreseeable future. According to Umansky, Intralot will provide the software and hardware to enable the District to provide the sports wagering, but will not be involved in the actual sites or the app. D.C. still needs to reach a deal with a company that would be in charge of designing the mobile sports betting app. Once a company is selected, the D.C. Council and Bowser must approve the contract. From there, city officials tell NBC Washington’s Mark Seagraves that the mobile app will need six months for development, testing and implementation. That would mean you won’t be able to place a bet on your smartphone until January 2020 at the earliest. Umansky said that the decision has not been made yet as far as whether someone could bet on college games once sports betting is legalized. As of now, there are no restrictions — unlike those attached to bills that have been introduced in Virginia and New Hampshire — but that could be in the works. “You’re talking about an organization that openly admits that they created the term student-athlete out of thin air to avoid paying workers’ compensation benefits,” she said. What happens to the black market? Minton goes on to suggest that banks are getting worried after the Department of Justice reversed the Wire Act Opinion about incidentally making a transaction between state lines. “If the data just bounces over to another state in the process of routing, (the banks) are worried that they could be caught engaging in a federal crime,” she said. Brett Smiley is the editor-in-chief of Sportshandle.com, which provides up-to-date information on sports betting regulation in the U.S. Smiley said that while places like D.C. and other states now have or are moving toward legalization, a large swath of the country still does not have access to a legal market. Dr. Howard Shaffer, who is Distinguished Faculty at the Division on Addiction at Harvard-affiliated Cambridge Health Alliance, a Harvard Medical School Teaching Hospital agrees. “When you introduce gambling, you’ll tend to see a novelty effect where people try it and participate in it,” he told WTOP. 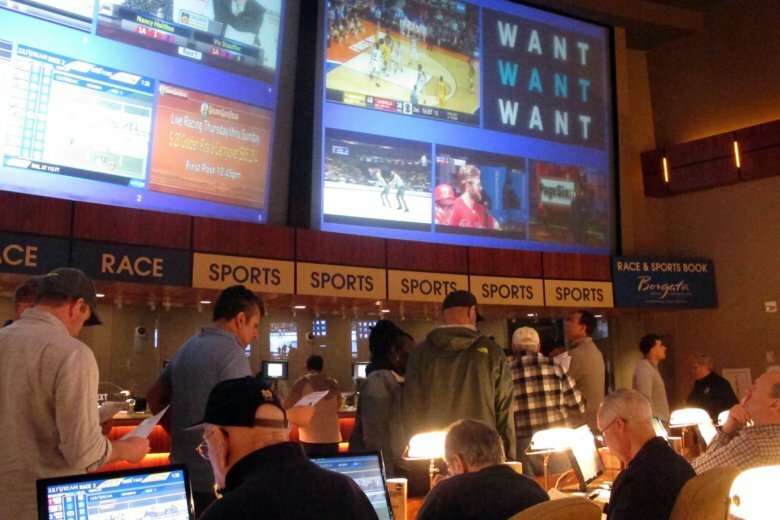 D.C. will soon join West Virginia and seven other states that have legalized sports betting and the Office of the CFO projects legalization will raise $92 million for city coffers of the next four years. D.C. is unique locally in allowing sports betting in its brick-and-mortar venues, since there are no licensed casinos in the District unlike Maryland and Virginia. The two neighboring states may follow suit and legalize sports betting eventually, but not anytime soon — a decision to move forward in Maryland won’t come until the 2020 ballot and legislation was defeated this session in the Virginia General Assembly. So if you live nearby in one of those states, If you want to place legally bet on (or against) the Redskins or Ravens this upcoming football season, you’ll have to travel down to Chinatown or Southeast D.C.